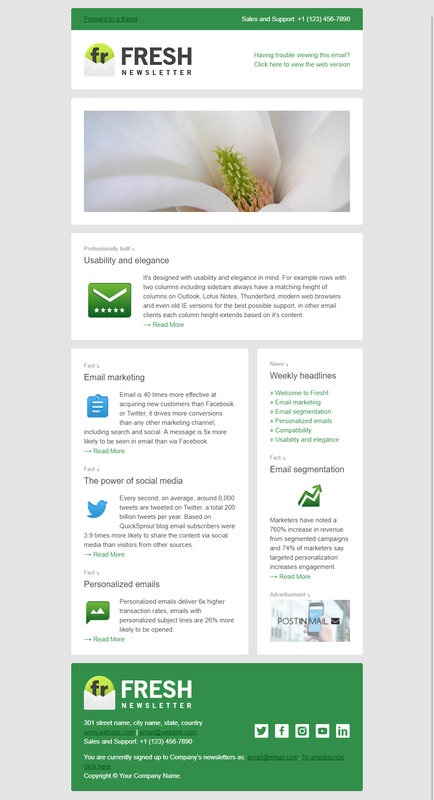 Fresh Newsletter is hybrid responsive email template. Clean classic design fits wide range of marketing, newsletter and e-commerce usage. It comes in 10 layouts, 8 colors and 2 background versions. You also get the access to the layout builder where you can build custom layouts and color schemes. 160 Hybrid HTML email templates included in the download (10 layouts in 8 color schemes and 2 background versions). Access to layout builder where you can add/remove modules and sub-modules, choose from the pre-made color schemes or create a new color scheme, edit layout’s text and insert your images, download the HTML layout or export it directly to your Mailchimp account and other helpful features. Placeholders PSD file with social icons and images dimensions. User friendly documentation which covers editing and sending the template, using it in Aweber, Constant Contact, iContact, Mailchimp and Vertical Response. 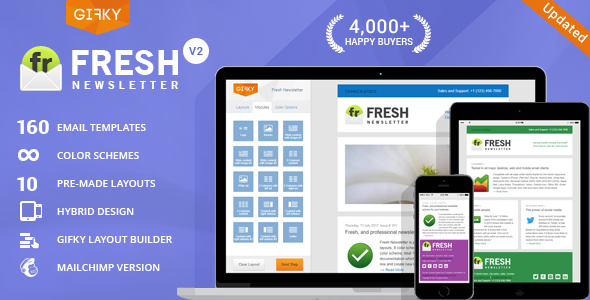 Fresh Newsletter is compatible with all major email clients. It can be used in any email program or online service which support importing/editing HTML code (such as Aweber, Constant Contact, iContact, Mailchimp and Vertical Response, etc…), although the email template renders perfectly in Outlook 2007-2016 it’s not recommended to use Outlook to send it to your clients. Template has been optimized for rendering in Outlook 2007-2016 versions including those running under 120 DPI. Outlook 2007-2010 and old browsers don’t support border-radius (rounded corners). Access to our layout builder is complementary to all Fresh Newsletter buyers as long as you hold a valid license and this product is available for purchase. Picture of Magnolia flower by richard_b.